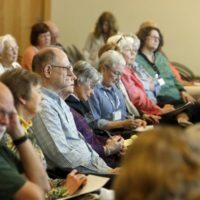 Watch video of Vanderbilt Professor David A. Weintraub speaking April 27 on “How Old is the Universe?” as part of the Osher Lifelong Learning Institute. David A. Weintraub is professor of astronomy, director of the Communication of Science & Technology program, and director of Undergraduate Studies for Department of Physics & Astronomy at Vanderbilt University. The title question about the age of our universe poses a deceptively simple question, and its answer carries profound implications for science, religion and philosophy. In this class, we will trace the centuries-old quest by astronomers to fathom the secrets of the nighttime sky. We will discover how they have used their knowledge of astrophysics and their observations of the heavens to determine that the universe is 13.7 billion years old. By the end of the course, you will understand why astronomers know this is the answer to the title question. Individual classes will focus on 1) ancient answers for the age of the universe, Renaissance science’s impact on that ancient wisdom, and Biblical Chronology as a reasonable seventeenth century response to the birth of modern science; 2) nineteenth-century discoveries that changed astronomy into astrophysics; 3) white dwarf stars as a chronometer for the age of the universe; 4) star clusters as another tool for measuring the age of the universe; 5) the expanding universe as a third method for dating the universe; 6) maps of the cosmic background radiation, dark matter and dark energy as a fourth method for determining the age of the universe. No background in math, astronomy, or physics is required to understand this material.